Maybe it's the rural girl in me, or maybe I long for a past I never lived (poodle skirts, ponytails and roller rinks), but something about grungy diners makes me assume their food will be wholesome and delicious. This nostalgic fantasizing has kept me dressed in knee socks and cardigans well into adulthood, and nurtured a lifelong interest in diner classics like ruben sandwiches, corn-beefed hash and poutine with vinegar. On the low end of the high/low culture clash that is Cumberland Terrace, Vienna Gourmet has all the allure of an authentic old-school lunch shack. 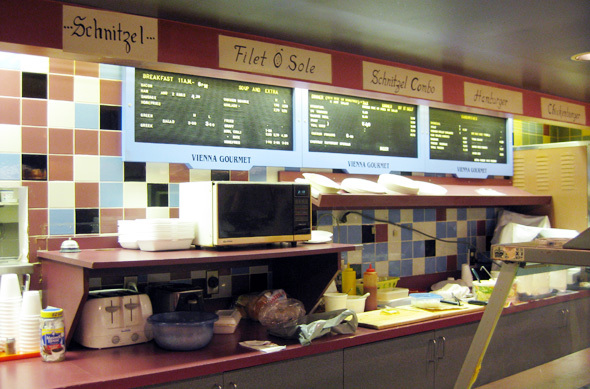 A plastic, slide-letter menu advertises daily specials under a series of faded, 80s-style food prints, the pictures of fountain pop unceremoniously covered in "NOT INCLUDED!" signs. Cafeteria-style troughs cradle pre-made portions glowing in the warmth of the heat lamp, and a hand-lettered sandwich board welcomes hungry patrons. There's something selfless about this kind of decrepitude, something that suggests a by-gone era of honest-to-goodness citizenship: a time when business owners refused to match their fees to the market, cleaving to antiquated prices and good-old-fashioned service, profits be darned! For a romantic like me, it's easy to believe that a place this tinged in grease and melancholy exists because its owners have been consistently schlepping hearty servings of cheap, tasty diner fare - not to mention witty anecdotes and salty aphorisms. Next time I try to wax lyrical about the proletarian joys of diner fare, however, I'll remember this trip to Vienna Gourmet. At $5.50 (pop NOT INCLUDED! ), the schnitzel combo was not, as I'd hoped, a quality meal for a steal, but rather an invitation to start turning city-slicker cynical. In a word: gross. I will give it this: I had spent the morning wandering fancy-pantsy Yorkville , and needed a place where I could settle back into my country boots and frugal budget, something a little more down-to-earth. Vienna Gourmet certainly fit the bill. Surrounded by cracked booths, grease-topped tables and an audibly farting fellow diner (seriously: he was doing cheek lifts! ), I felt no shame in eating my schnitzel with my hands. 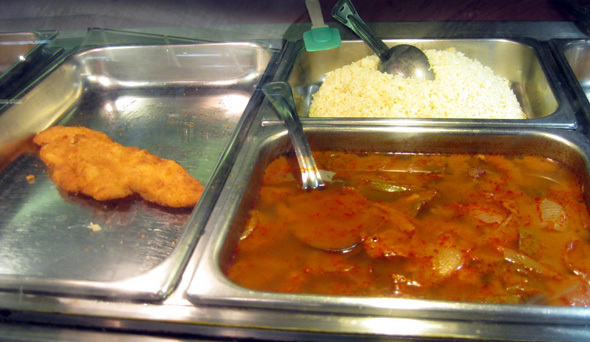 Frankly, it was the only way: in the battle between plastic cutlery and schnitzel, the schnitzel was clearly toughest. The only redeeming part about my lunch was the nostalgia-inducing rice, and even that was good for just one bite. Fluffy, distinct grains with a mild cardboard flavour reminded me of my country youth, and why small-town kids always douse their Uncle Ben's in butter or soy sauce. Kitschy, nostalgic, melancholy, grease-speckled: all these descriptions readily apply. But the two words I could never associate with my trip to Vienna Gourmet? Vienna and gourmet.